Why is EFM Ringwood the Best Gym in Ringwood? Dedicated to providing cost effective fitness solutions, we look forward to introducing you to our proven formula for success in fitness, weight loss and general health and well-being. As a valued EFM Health Club member, you have a qualified Fitness Coach on hand every session to provide encouragement and support and the guidance you need to achieve your goals. Your membership is a Flexible Monthly Membership, so you’re not weighed down by a lock-in contract giving you great peace of mind that you will receive a tailored, results focused program for ongoing satisfaction. The club is well equipped with top of the line cardio machines, barbells, dumbbells, kettlebells, medicine balls and much more. We service many members from the following suburbs Ringwood, Ringwood East, Croydon, Croydon North, Wantirna, Donvale, Mitcham, Heathmont. Feel free to give me a call at anytime with any enquiries, or just pop down during the opening hours and have a look for yourself! Better yet register for our special offer to the right of your screen and experience it for yourself! Ramsey Nasser & the team at EFM Ringwood gym. Your experienced fitness coach Ramsey Nasser started his fitness career in 2007. He is a registered fitness professional with Fitness Australia. Ramsey has worked with clients who never imagined they could lose all the weight they wanted while getting fit, feeling healthy and unlocking energy levels not experienced for years. 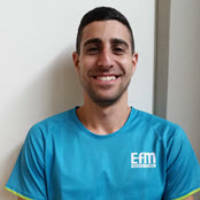 If you have never been to a gym before, looking for an alternative to your regular gym, or you just want to lose those extra winter kilos, then Ramsey can help you at EFM Health Club Ringwood.